This video provides a demonstration for volunteers at a general population shelter of the appropriate way to prevent an individual from falling or who is loosing their balance. 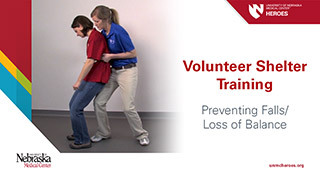 This is part of a series of Volunteer Shelter Training videos produced in collaboration with the Physical Therapy program at UNMCs College of Allied Health Professions. 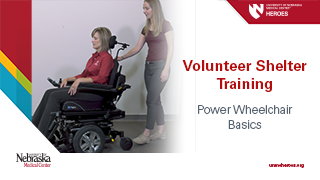 This video provides an overview of the components and use of a Power Wheelchair for volunteers at a general population shelter. 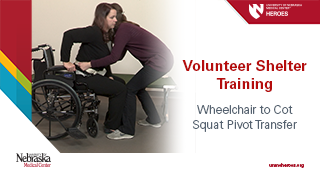 This video provides a demonstration for volunteers at a general population shelter of the appropriate way to transfer an individual from a cot to a wheelchair using a squat pivot technique. 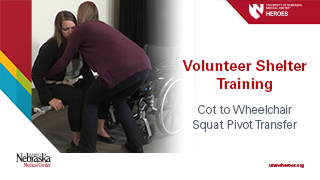 This video provides a demonstration for volunteers at a general population shelter of the appropriate way to transfer an individual from a wheelchair to a cot using a squat pivot technique. 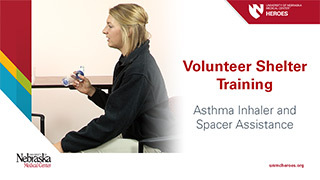 This video provides a demonstration for volunteers at a general population shelter of the appropriate way to assist an individual in the use of an asthma inhaler with a spacer. 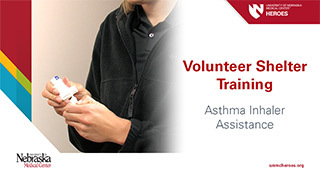 This video provides a demonstration for volunteers at a general population shelter of the appropriate way to assist an individual in the use of an asthma inhaler. 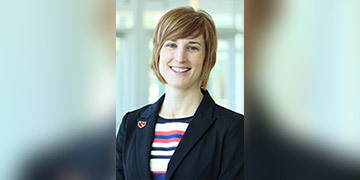 Sara Bills is an Assistant Professor in the Division of Physical Therapy Education, University of Nebraska Medical Center.